Health Partners America attracts major interest from hundreds of insurance agents across the country with its latest white paper, “Defined Contribution... 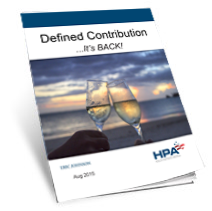 It's Back!” The high volume of downloads demonstrates the on-going interest in defined contribution from brokers and their respective clients, despite the ever-changing rules and regulations surrounding the platform. Health Partners America (http://www.healthpartnersamerica.com), a leading provider of private exchange sites, training, tools, and technology solutions for insurance agents and employers who are navigating the health reform legislation, announces the release of its new white paper – Defined Contribution…It’s Back. This timely 17-page document was written to help insurance agents and brokers better understand the current status of the defined contribution platform and how it pertains to their business clients. Defined contribution is a concept that was originally applied to retirement plans. Several years ago, companies began transitioning away from “defined benefit” pension plans, opting instead to make “defined contributions” into individually owned accounts like 401(k) plans. Similar developments are now seen across group health insurance. Tired of dealing with unpredictable annual premium increases on their group health plans and the difficulty of selecting a “one-size-fits-all” benefit design for an increasingly diverse workforce, a growing number of large employers are beginning to offer “defined contribution” plans, often through a private exchange site that allows employees to learn about their options and enroll in their core and ancillary benefits online. Since 2007, Health Partners America has been providing game-changing training, marketing tools, and strategic solutions to agents and brokers nationwide. HPA is a leading provider of private exchange sites and works with brokers to help them achieve their ultimate success through proven processes. For additional information about this topic or about HPA, contact Doug Foshee at 205-443-2186, visit us on the web at http://www.healthpartnersamerica.com, or follow us on social media.